Good morning, friends! Today, I am so happy that you stopped by for a visit. I’m so sorry that I have been absent for the past two weeks. As soon as the painter’s finished, I had to scurry around to get my house ready to host a surprise party for my Grandmother’s 88th birthday. A few days later, I hosted another party for my sweet Caroline’s 15th birthday. It means so much to me to be near my family again. Family comes first, and it makes me so happy to be able to spend time with them. 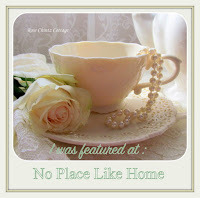 Next week, I am so excited to be participating in a Holiday Home Tour Blog Hop. Since I am not hosting Thanksgiving this year, I have been busy as a bee decorating for the holidays. I’ll have to admit, it has been a lot of fun. Also, I have a couple of changes in the dining room that I can’t wait to share with you. For today, I’m anxious to show you my sunroom. It is a traditional French country space filled with lots of wonderful color, red to be exact. As you know, I love red as much as I do blue. A couple of weeks ago, I told you about an estate sale I attended. It was a gorgeous home that had been decorated by the late Charles Faudree. It was just like stepping into one of his beautiful design books. Purchasing a couple of items from the sale, I honestly cannot even fathom selling items that Mr. Faudree chose for your home….what treasures! One of the items I purchased for my sunroom was a red toile loveseat. In my opinion, nothing is more timeless and traditional in French Country design than toile. This sunroom sits at the end of a long room with cathedral ceilings. The room houses both my kitchen and breakfast area. This particular spot is the perfect place to enjoy a cup of coffee or tea and read the morning newspaper. I would like to find a couple of antique French side tables to place at both ends of the loveseat. For now, these tables will work. They were in my previous home’s bonus room. The two chairs in the sunroom are Ethan Allen chairs that previously belonged to my in-laws. You may remember, they were in my previous home’s bonus room. They were covered in a dark paisley fabric. I chose this fabric because it matched well to the existing window valances. The valances that came with the house were custom made and would cost a pretty penny to replace. Therefore, I just decided to work with them. I already had the red ottoman and rug. The loveseat was just waiting to perfectly complete the space. If you can believe it, I was fifth in line and had to wait two and a half hours to get it. When I left the sale, there were at least a hundred people waiting in line. Mr. Faudree decorated many homes in this town, and when there are sales featuring his work, people gather by the hundreds to attend. It just goes to show that his look was timeless. On a side note, I have owned these Staffordshire dogs for a while. At the sale, there wasn’t just a few Staffordshire pieces, there were over fifty pieces! There was also an impressive collection of red transferware and lots of pretty Charles Faudree lamps. If you have studied his designs, you know that the lamps were always gorgeous. I wish I could have taken pictures to share with you. It was just so crowded with people snatching and grabbing things. It was both unbelievable and a little overwhelming. The photograph below gives you a better look at the valances. These valances are hung throughout the sunroom, breakfast nook, and kitchen. There are lots of windows in this space, and I love the natural light they allow to enter the room. I have one more item to share with you that I bought at the estate sale. You will see it next week when I show you my dining room decorated for the holidays. Again, I am so happy that you stopped by for a visit, and I hope that you have a happy and blessed day! Everything is coming together beautifully and I am not surprised. Linda, you are so sweet! Thank you so much for your kind words! I hope that you have a Happy Thanksgiving!!! First of all Happy Birthday to the beautiful ladies in your life..such momentous birthdays…88…double infinity! A special birthday celebrated so honorably in our family….I still cannot believe that you were able to attend an estate sale of a home decorated by the late, great Charles Faudree….can’t imagine how beautiful that home was….love your sunroom..yes, looks like a page out of one of his books…the loveseat was a beautiful find and love the transformation of the chairs. The sunroom is beautiful Shannon!!! Thank you, Shirley! It was so much fun being able to host a party for both of these special people. I love them both so much! I hope that you have a Happy Thanksgiving!!! Shannon, how fortunate that you live where you can buy from homes decorated by my favorite designer, the late Mr. Faudree. The toile loveseat is perfect for your sunroom and I love the newly upholstered chairs. What gorgeous light in your space. Happy belated birthday to your grandmother and sweet daughter. I am busy as a bee preparing for Thanksgiving and the blog hop…never before have I mixed Christmas with Thanksgiving! Thank you, Pam! You know Mr. Faudree is my favorite desinger, too. I never tire of looking at his beautiful designs. I hope that you and your family have a very Happy Thanksgiving holiday!!! Thank you, sweet Lidy, for your very kind words. I hope that you and your family have a very blessed and happy Thanksgiving holiday!!! Shannon, how wonderful for you to have Mr. Faudree’s loveseat in your home! It pairs beautifully with the chairs. Oh my goodness, you have his french pastry table too, have you ever thought about bringing the two together maybe for Christmas??!! Love this room!! Thank you, Jan, for the sweet comment! You are right…I may just have to bring the two together some time. I hope that you and your family have a very Happy Thanksgiving holiday!!! Shannon, your sunroom is beautiful! I still can’t believe you were able to go to an estate sale of one his homes! Just so wonderful. I love the beautiful toile and the fabric on the ethan Allen chairs! Happy Thanksgiving! Thank you, Angelina! I hope that you have a happy and blessed Thanksgiving!!! Your room looks beautiful, Shannon. I am such a fan of the late Charles Faudree and you must be thrilled to own a piece designed by such a talent. Happy Monday, my friend! Thank you for the sweet words! I hope that you have a Happy Thanksgiving!!! You inspire me! I love your gentle style and I have always respected Charles Faudree. I have one of his decorating books too! Jemma, you are so sweet! Thank you for the very kind words! I hope that you have a Happy Thanksgiving!!! Thank you, Eilis! I have been busy as a bee decorating for Christmas, but it has been a lot of fun! I hope that you have a Happy Thanksgiving!!! I love your sunroom, you are so lucky. I’ve been wishing and hoping for such a room for a very long time now. Thank you, Ivory! It has always been of dream of mine to have a sunroom, and I am really enjoying this space. I hope that you have a very Happy Thanksgiving!!! Wow, you have had some very special and exciting things happening to you. Your sunroom is gorgeous. I love toile and when it is in my favorite color, red well let’s just say I can’t ooh and ahh enough. I certainly can see this as being one of your favorite rooms in the house. Thank you, sweet Debra! This space is becoming one of my favorite rooms to spend time in. I hope that you have a very happy and blessed Thanksgiving!!! Shannon: Your sunroom is beautiful. And, like you, I can’t imagine parting with things which were thought through and purchased by Charles Faudree. We lost something so special when we lost him. I do love the toile love seat – it is perfect in your room. Your Staffordshire dogs are also beautiful. Looking forward to what may be in your dining room.